It was wildcard night at this week's TUF 13 episode. Check out who between Chuck O'Neil and Javier Torres made it for the win. Last night’s episode reminds the audience of this season’s wildcard fight between Team Lesnar’s Chuck O’Neil and Team Dos Santos’ Javier Torres. However, this selection continues to bug Len Bentley of Team Lesnar and opted to confront UFC President, Dana White. Surprisingly, the fighter campaigns for a fight against Ryan McGillivray on the undercard of TUF 13’s live finale. Visibly confused, Dana White stresses to Len Bentley why he didn’t get the wild card pick, saying that the fighter doesn’t seem ready to fight. This made the Len Bentley even more bothered, as he thought that his past fight spoke for itself. Back at the house, he voices his complaints to anyone who will listen, and all of them are starting to grow tired of it. Ryan McGillivray then told him that according to Junior Dos Santos, Brock Lesnar felt that Len Bentley wasn’t ready to fight. At the Team Dos Santos training session, the coach and his team are focused on getting Javier Torres ready for his fight. While at the Team Lesnar session, Len Bentley arrives at the gym and eventually asked his coach why he didn’t make it to the wildcard. As a reply, Brock Lesnar pointed out the fighter’s injured knee and emphasized that they needed healthy fighters. Len Bentley simply shrugs and went back to training. The focus then turns to Chuck O’Neil, who puzzles his coach and looks like he doesn’t even want to fight. 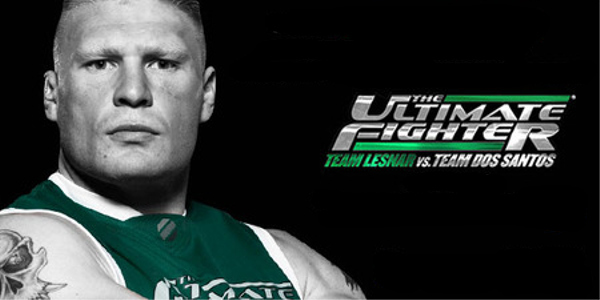 Soon, both Team Lesnar and Team Dos Santos left the TUF House and arrived at the Fertitta Field at Bishop Gorman High School in Las Vegas. This season, the coaches are challenged for a football obstacle course. And with Brock Lesnar who almost made it to the Minnesota Viking, he definitely has the edge. However, Junior Dos Santos was able to outdone him and won $10,000. With each cast member of Team Dos Santos winning $1,500, the coach shared his price and gave each Team Lesnar members $100 and $500 for every assistant coach. He jokingly said that Brock Lesnar won’t get anything since he lost. The whole cast then heads back to the training center for their weigh-in and final pre-fight preparations. Soon it was fight time. During the first round, both fighters paw their jabs and looked for an opening. Javier Torres lands a front kick, while Chuck O’neil answers with a high kick. The latter then tries for the trip-takedown, but his opponent fights it off and reverses to deliver a couple of knees to the body. Then both of them traded knees, punches and kicks. They broke and extremely closed out the round trading more knees from the clinch. For the second round, the fighters traded low kicks, and Chuck O’Neil landed a nice right. Javier Torres then answers with a quick left, and gets the better position when his opponent looked for a takedown. He forces the fight to the mat while in side mount, and looks for a choke on his way up. However, the Team Lesnar member fights it off and then gets his own takedown while landing in half guard. However, Chuck O’Neil was forced to abandon it eventually. The Team Dos Santos representative looked for the escape, but his contender kept him pinned to the canvas. He desperately looked for the sweep and finally gets it, but Chuck O’Neil locks on an arm-triangle choke and torques it from the kneeling position. When he rolled to his back, Javier Torres tried to defend but was forced to tap out. Brock Lesnar was ecstatic of the result, while Chuck O’Neil was pleased that he was able to perform like he knew he could. Dana White is also glad of the outcome and immediately announced to quarterfinal match-ups. Next week, the quarterfinal round will take action, as eight TUF 13 cast members will be down to four. Who’s your bet to stay? Share it by leaving a comment.